Bay and bow windows are a great way to improve the curb appeal of your home and the beauty inside. Both styles extend past the façade of your home to give it more depth and dimension. They’re made of a configuration of 3 to 5 windows with a window seat. Bay and bow windows are made a little differently. Bay windows consist of 3 windows. The center window is a picture window and it’s flanked by either a double hung or a casement window on each side. On the other hand, bow windows consist of 3-5 windows and can be any combination of casement and picture windows. Bay and bow windows have the benefits of both operable and inoperable windows. You’ll be able to open the casement or double hung windows to enjoy a cool breeze while enjoying the added sunlight the picture windows allow into your home. Both bay and bow windows are stunningly beautiful. On the outside, they extend past the façade of your home. The added depth will improve your home’s curb appeal. They also improve how your home looks from the inside. The added light will make the rest of your room pop and will make it look larger. A bay or bow window can really tie the entire room together. The way bay and bow windows are made creates a window seat inside your home. This added space is great for displaying knick-knacks or provides another place for guests to sit. 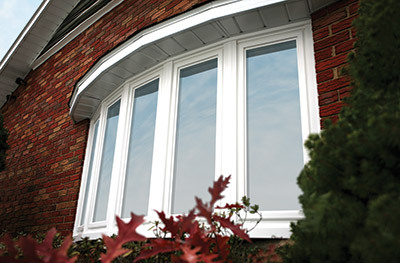 Our bay and bow windows are made from energy efficient vinyl. The frames are foam insulated while the glass is argon gas-filled. No heat or air will be escaping from these windows. This is important for two reasons. The first is your home will be more comfortable year round. No matter what the weather is outside, your home will be the perfect temperature. You’ll also save money on your energy bills. Reaching your desired temperature puts stress on your furnace and air conditioner. Having energy efficient vinyl bay and bow windows eliminates some of the stress and power required to heat or cool your home. 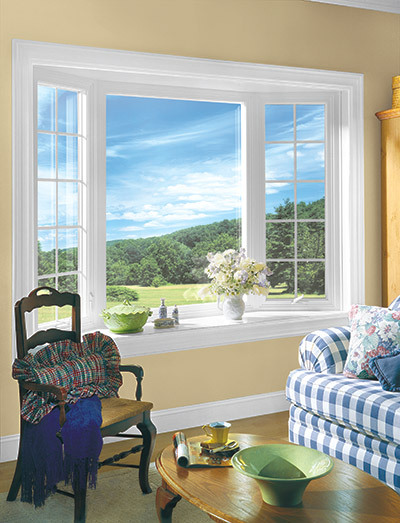 Bay and bow windows require larger openings than other replacement window styles. They’re both best used in a living room or family room. If you have the space, they also look great in a bedroom.